to Anemos Restaurant & Cafe. 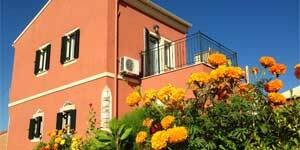 we are located at the top of the village of Afionas in the Northen West of Corfu. Our location is unique and offers an amazing view as we overlook the bay of Arillas and the Diapontia islands - Othoni, Erikousa and Mathraki. You get to walk through the traditional and very beautiful village of Afionas to the restaurant, as it is at the tip of the headland between the two bays of Arillas and San George. Anemos is open from early in the morning till late in the evening, offering a great variety of coffees, snacks, refreshing cocktails & of course Greek traditional food, which you can enjoy throughout the day. 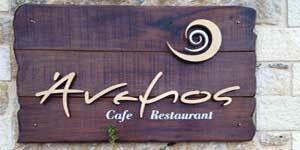 You can find us in the village of Afionas which is overlooking the Arillas Bay and the Gravia Island. 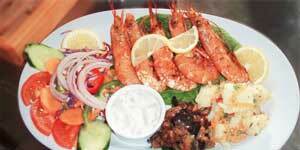 We offer a variety of Greek-Corfian traditional dishes, coffees, salads, snacks & desserts. Looking for accomodation? Have a look at our "Anemos Apartment" which offers stunning views. We open daily from early May until late October, from 9.00 in the morning till late in the evening .